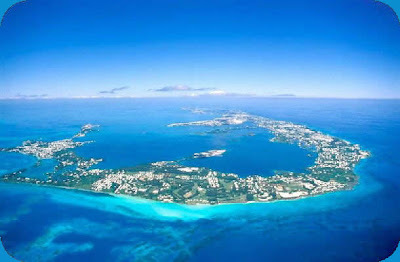 July 28, 1609: Survivors of the wreck of the English ship Sea Venture, bound for Virginia, become the first Europeans to settle on the island of Bermuda (shown above). When I was a girl, my father would say, “Let’s go for a ride.” Often that meant piling in the car and just wasting gas (back when you could do that) but sometimes it meant taking the boat to the launch and getting out on the water – usually Lake Washington or Hood’s Canal. Those were the rides I loved. Long before my day, though, ride meant something else again. At least at sea. Most people are familiar with a ship at anchor being said to “ride”. Though no one is really sure, this probably comes from the fact that a ship does not sit in one place when anchored, like a car in a parking lot. She literally rides around her anchor with the influence of wind, wave and tide. A ship may ride, as noted in The Sailor’s Word Book, “…easily, apeak, athwart, head to wind, out a gale, open hawse, to the tide, to the wind, &c.” It’s the etcetera that really gets you there, making it seem as if there must be hundreds of ways for a ship to ride. And so there are. A rope or cable can also be said to ride when it kinks on itself or jams the turn of a capstan. Casting fishermen are familiar with this type of action with the line on their rod. Damned inconvenient at best, and a much larger challenge with heavy anchor cable. Riders are pieces of wood attached to a ship’s decking to correct damage done at sea. They are a temporary measure by and large, although some ships carried riders routinely. Technically, riders run vertically from fore to aft, while stringers fit horizontally across the beam. This is also the term for casks or crates that are stowed on top of others, with only the bottom tier of cargo not referred to as riders. A riding bitt is one to which rope has been fastened. A ship is said to be riding a port last when her yards have been lowered to her gunnels for repair or in preparation of sitting in ordinary. Riding down can be one of two things done by crewmen. It may be a sailor putting his weight on a sail head to stretch the canvas out. Or, it can be a sailor coming down a rope or cable from top to bottom while tarring it; an ongoing process on any sailing ship. And that, as they say, is enough for today. It’s beautiful outside; I may just put on my sailing gear and go for a ride. I'm always excited about a city that is eager to celebrate its piratical history. Fortunately, there are many such around the world. In the U.S. though, it seems that those most eager of all are along the southern Atlantic and Gulf coasts. Galveston, Texas and St. Augustine, Florida are both adding to their already impressive offerings of memorabilia so I thought I’d give the Brethren a heads up. The interesting thing is that both locales have a little bit of old Galvez Town in them. 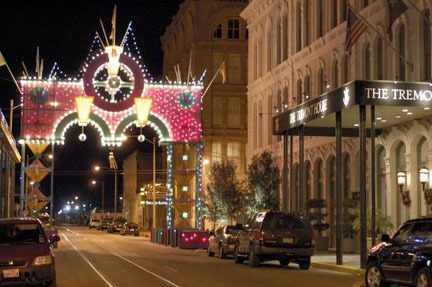 First, Galveston: this island, originally known as St. Louis in the 16th century, was named after explorer Bernardo Galvez who staked it out for Spain. 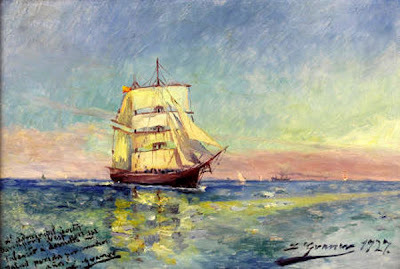 It remained uninhabited until the early 19th century when Louis Aury tried to establish an ill-fated privateering base there. The Laffite brothers mopped up Aury’s mess and turned the island into a thriving hub for privateers and smugglers alike. Now a new Laffite-centric attraction will premiere at The Strand. According to this article from the Galveston Daily News, Joyce McLean is putting together an attraction she’s calling Pirates! Legends of the Gulf Coast. It will be built to resemble the deck and great cabin of a pirate ship and feature “… myths and legends…” of the Laffite brothers. Pirates! will also serve up information about Jane Long, the so called “Mother of Texas” who once dined with Jean Laffite. While Ms. McLean states that Pirates! will be a “… fact-based interactive, fun experience,” I’ll withhold judgment on the facts clause until my next visit to Galveston. I’ve absolutely no doubt about the fun, however. Next up is this snippet from the St. Augustine Record. It goes without saying the oldest city in the U.S. has a long history of seafaring so it was probably no big surprise when three oak ribs of a sailing ship were found near Savilla Street. Though the article does not pin point a date, the ship is from the 18th century and the pieces are now in Malaga, Spain (home of one of the most talented artists I know). There they will form the base of a rebuilt replica of the ship named Galveztown. Interestingly, oak from the St. Augustine area is being used in her construction. Though the article is sketchy on details and manages to confuse a brigantine with a galley, the end result – if it is realized – will be a wonderful piece of living history. The vision is to crew Galveztown with a combined U.S. and Spanish crew and use it as a teaching vessel during cruises between Malaga and St. Augustine. Put me on the waiting list! Well, Brethren, the wheel has turned again and almost surprisingly Triple P has reached the ripe old age of two. I think that makes her 14 in “dog years”. As a special gift to all who stop by and especially to say thank you to the Brethren of the Coast for sailing in company, a guest post is in order. From one of my favorite writers on the web or anywhere else for that matter, a movie review with a seafaring bent. Find House in Rlyeh aka Denis, who is an esteemed member of the Mysterious Order of the Skeleton Suit, delving into much more than just movies over at his delightful site The Horror!? and occasionally at WTF-Film. You can also follow him on Twitter. Today, though, he’s right here; enjoy! 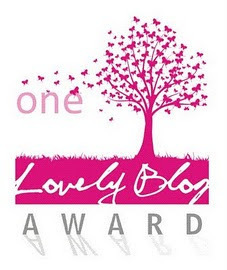 When our gracious host Pauline first asked me to contribute a post to her blogging anniversary on Triple P, I was in a bit of internal panic. After all, what business does a guy who hasn't even read all Aubrey/Maturin novels have on a blog as encyclopaedically knowledgeable about all things nautical and piratical as Pauline's is? Obviously, the business of talking about a movie that takes place on the sea, because if there's one thing I can go on and on and on about, it's movies. But even here, I found myself confronted by a problem: talking about some classic swashbuckler would be a bit boring, but going the other way - in the direction of true non-classics - would only lead directly into the arms of Ship of Zombies, the by far worst of the Blind Dead movies, and that's not a film I want to inflict on anybody via a guest blog, especially not on an anniversary. Fortunately, one of my secret favourite movies came to the rescue in form of Val Lewton's production of Mark Robson's The Ghost Ship, made in 1943. Now, Lewton's stint with the b-movie arm of RKO studios has resulted in a small but fantastic corpus of horror films of a type that was much more psychologically oriented and ambiguous than its contemporaries (and much less ruined by comic relief and an obvious hatred of the audience for such films as were - for example - Universal's films of the same type at the time). Today, the most well-known film of these is of course Jacques Tourneur's Cat People, but The Ghost Ship's Mark Robson's The Seventh Victim (also made in 1943) is just as fine a movie. 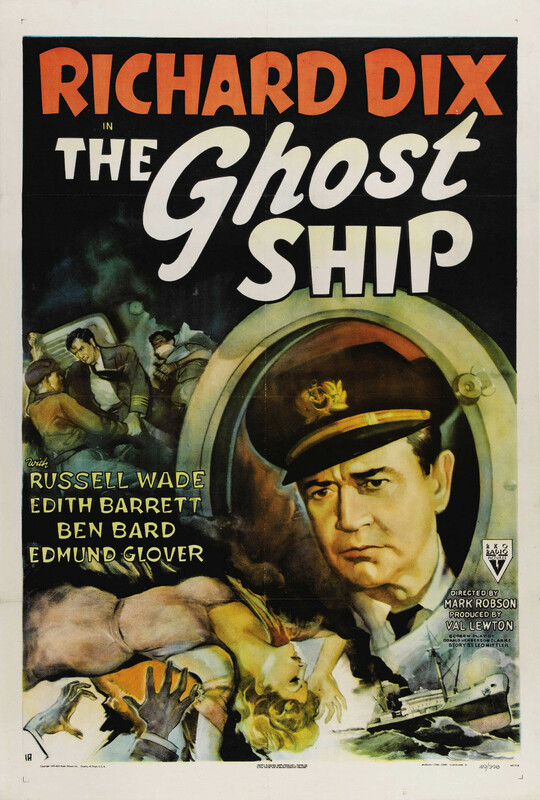 The Ghost Ship for its part is not quite up to the standards of mood and subtlety of those films, although it is still a fine and thoughtful piece of work. Orphan Tom Merriam (Russell Wade) arrives at his first post at sea (beyond duty on training ships) as the 3rd Officer of the Altair under Captain Will Stone (Richard Dix). 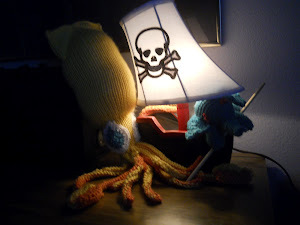 Though their journey together starts with a bad omen in form of the death of an older seaman, Tom is quite happy with his new position and his new Captain. Stone seems to have taken an instant liking to the young man, and delights him with quite a few fatherly monologues about the nature of authority. Actually, someone less positive (or naive) than Tom could argue that Stone is somewhat obsessed with the concept of authority and tends to the monolithical side of the idea that sees a captain at sea taking on a role comparable to that of an absolute monarch or a dictator on land. When push inevitably comes to shove, Tom learns that his Captain's much-loved "authority" is one that is only interested in bathing in its own perceived perfection and has little time for minor quibbles like the life and limbs of his crew. At first, it is only minor (yet, the sea being a dangerous place, still dangerous) things that could make Tom doubt the Captain's competence or - perhaps - even his sanity, and it's really more the spin Stone puts on things than what he actually does or doesn't do that keeps the viewer more uncomfortable with him than the young man is. But when Stone isn't able to make the necessary incisions in a (radio-supported) appendix operation on a crewman, and Tom has to take the scalpel, the young officer begins to doubt his new-found father figure. Even so, Tom still asks the only witness to the whole affair, his (just as new-found) friend the radio operator Sparks (Edmund Glover), not to tell anyone who really took on the operation in the end. Not everyone can take looking at blood, after all, and there's no shame in that. Stone explains the situation to Tom a bit differently, though: as somebody without any expertise in medicine, he was afraid to fail in saving the crewman's life. Although he's not completely able to ignore the fact that not trying the operation would have damned the sick man to death in any case, and though he probably perceives that the unspoken undercurrent of Stone's behaviour suggests he's much more afraid of being seen as fallible than of failure itself, Tom still seems to waver in his opinion about Stone. Things change rather quickly when the ship's resident sea lawyer is crushed by the anchor chain shortly after he delivered a minor complaint to his captain. The audience knows this death is at least caused by Stone's negligence (and might just have been murder), but that's not something anyone else in the crew realizes - except for Tom, who meets Stone practically next to the dead body. The Captain is all too ready to deliver a slightly deranged monologue that would convince anyone that he had something to do with the sailor's death. Tom at least is now sure that Stone is a homicidal maniac, and he's not afraid of telling him or anyone else about it. Alas, nobody on board the ship does believe him. Once back in port, the young man tries to convince the authorities of his shipping line of Stone's guilt, but - not surprisingly - only loses his position on the Altair. And that could be the end, with a slightly damaged career for Tom and Stone still captain of his ship, ready to crack any day now, if an unfortunate accident would not leave our young hero back on board the Altair. Tom's inability to keep his head down and Stone's growing paranoia mean that the whole affair will end in violence. As the synopsis should make clear, Robson's film isn't exactly the horror film one would suspect. The ghost ship of its title is a metaphorical one, describing the state of isolation that is the part of his position as a Captain that is responsible of driving Stone to the brink of madness, but also describing the comparable isolation Tom - as an orphan and a man without friends or companionship on land - is in, as well as the young officer's later isolation on board the Altair when nobody wants to believe what he knows to be true about Stone until it is nearly too late for him. The film uses its sea-bound setting as the perfect place to take a close look at the horrors that arise from a blind trust in authority (obviously quite timely in 1943, and unfortunately quite timely again today) in a way that reminded me at times heavily of Joseph Conrad. The isolation and strict structures of life at sea are a backdrop that makes the film's themes all the more clear. The Ghost Ship isn't satisfied with only using Tom and Stone as elements to build an allegory from, though. The film is also an early example of the psychological thriller, and as such, it is actually interested in its protagonist and its antagonist as people, and not just as parts in its philosophical machine. Not only is Tom a much more believable hero than one is used to from films of its era, but Stone, too, is more than just a eye-rolling maniac, which is not at all what I expect to find in a film made in 1943 (or today, for that matter), even though Val Lewton's productions were often more willing to admit the humanity of the mentally ill than any of their peers. The Ghost Ship takes its time to show Stone as a man who knows he's losing touch with reality, but just can't find any way to get his grip again; asking for help is obviously right out for someone with his particular mental problems. Given how loaded the film is with subtext and ideas (I've actually left out a whole line of thought about the complicity of people under authority with the abuse of authority in this post, among other things), it's not much of a surprise that it does from time to time waver under this weight. The Ghost Ship's first two acts are somewhat slow and ponderous and very talky - a state of affairs that isn't exactly helped by a certain theatricality of the acting I haven't seen in any of the other Lewton productions I know - and the "thrilling" parts (as well realized by Robson as I'd expected him to) only begin once Tom is back on the Altair. The surface excitement is just the sugar to let The Ghost Ship's themes go down more easily. My most heartfelt appreciation goes to Denis for this wonderful addition to my humble blog’s repertoire. If you liked it as much as I did, hop over to The Horror!? and hit the follow button. Trust me; there’s plenty more where that came from. Finally, a big thank you to all who have supported Triple P over the course of her evolution, which is still in progress. Let us spread all canvas, Brethren, and sail forth into another piratical year! After all, there is not a moment to lose. People: "...Whom Nothing on Earth Could Terrify"
Richard Sawkins (sometimes spelled Sawkens) was probably born somewhere in Britain in the early 1650s. It is fair to say that he came from what would then have been called a “common” family as, like so many others of the Brethren, he went to sea while still a boy. He seems to have had the kind of winning personality that made men not only trust him, but want to follow him as well. When his biographer, fellow buccaneer Basil Ringrose, picks up his story, Sawkins is sitting in a Port Royal, Jamaica gaol awaiting trial for piracy. According to Philip Gosse in The Pirate’s Who’s Who, Sawkins was captured while captaining the sloop Success some time in 1677. Gosse, in fact, confuses his dates and has the prison term ending in December of 1679. Sawkins was in the Great South Sea by January of that year so this is impossible. As both Ringrose and Gosse note, however, Sawkins was somehow cleared of all charges, set free and returned to his buccaneering ways. 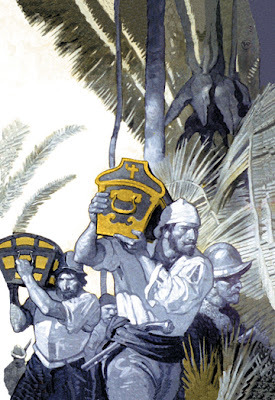 In command of a very small vessel bearing 30 crewmen and one gun, Sawkins joined with Captains John Coxon and Sharp in an expedition across the Darien Gap to the cities of Santa Maria, Santa Marta and finally the storied Panama City herself. The small army of over 300 men set out during the rainy season and was able to cross the Gap in canoes rather than marching as Morgan’s expedition had done. They were successful in a sack of Santa Maria, and a letter from Sawkins to the Archbishop of Santa Marta encouraged him to pay a healthy ransom for his city. Pressing on, the flotilla of canoes finally reached the Pacific Ocean just south of Panama City. 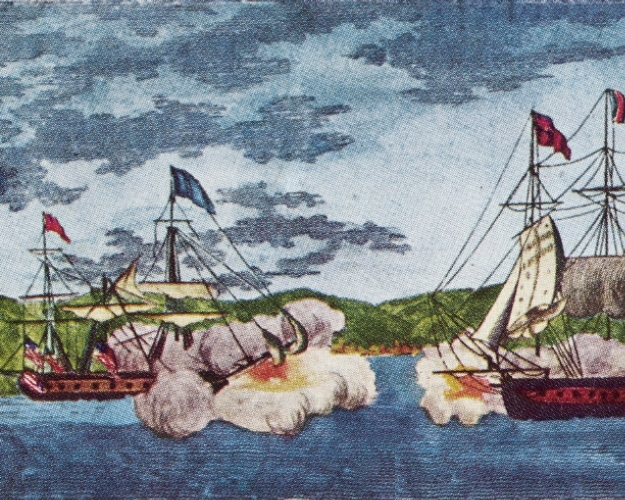 They took two small Spanish ships and pressed on toward the Gulf of Panama. There they found eight ships from the Spanish treasure fleet which, it seems, were unfortunately empty of wealth. The buccaneers went on the attack with what weapons they had and, after what Ringrose describes as a “… furious, bloody battle” they took the much larger ships. Coxon then ordered the harbor blockaded and long weeks of negotiation with the Governor of Panama began. It appears that Sawkins may have been the most articulate (and possibly the most literate) of the leaders in the buccaneer company as he was chosen to correspond with the Governor. When the Governor enquired why the buccaneers had blockaded the harbor, Sawkins wrote back rather righteously that he and his fellows had come to restore the “… rightful King of Darien”. He was referring to the native population, something that buccaneers rarely did in negotiations with Spain. Though they often used indigenous people’s knowledge of an area to their advantage, the vast majority of buccaneers were just as likely to abuse local natives as any other European. Getting nowhere with the Governor after a week, Sawkins learned that the Archbishop of Santa Marta was in Panama City. He sent the man two loaves of sugar along with a letter reminding him of his avoidance of a sack of his city earlier. The Archbishop was quick to respond, sending gifts of gold rings to the buccaneer commanders and promising to address the Governor on their behalf. … we will come and visit you in Panama and bring our commissions on the muzzles of our guns, at which time you should read them as plain as the flame of gunpowder could make it. Unfortunately, Sawkin’s verbal bravado was a feint. Men were growing ill from lack of fresh food and water; these buccaneers would be no match for a fortified town. Sawkins’ men finally convinced him to move down the coast and find better hunting. Some time before May of 1679 he relented, leaving Sharp and Coxon to go elsewhere. Sawkins’ ship arrived at the town of Pueblo Nueva and prepared to invade her. Doubtless the word had spread up and down the coast that ladrones were in Panama as the town was well armed and ready when they arrived. On May 22nd, Sawkins led his men in a charge up the beach; he was felled by a musket ball and died not long after. … a man who was as valiant and courageous as any man could be, and the best beloved of all our company. As Ringrose put it, Sawkins was “… a man whom nothing on earth could terrify.” That, in and of itself, is pretty impressive. 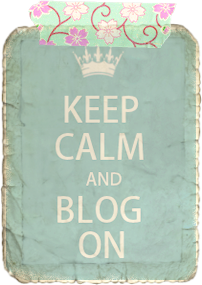 Finally, if you do nothing else tomorrow, be sure to stop by for a very special guest post in honor of Triple P’s second anniversary. Don’t you dare miss it, Brethren! I'm fascinated by how much ships weigh. It seems counter-intuitive to imagine a two million ton hunk of metal – like the Queen Mary 2 – floating blissfully on wave. At least to me. When I saw a chart of historical ships’ tonnage in Peter H. Spectre’s A Mariner’s Miscellany I thought I’d share just some of the weights in wood that have kept afloat, and moved men and history, over the centuries. I’ve added a few of my own favorites as well. Khufu’s famous monoreme, which now hangs in the Cairo Museum, displaced 94 tons. Medieval Cinque Ports ships that ran between Dover, Hastings, Hythe, Romney and Sandwich weighed, on average, 80 tons. Columbus’ Santa Maria was only about 100 tons. By comparison, Henry VIII’s Henri Grace a Dieu known as Great Harry, weighed in at a whopping 1,200 tons where as Mary Rose was 600 tons and Drake’s Golden Hinde was a mere 120. 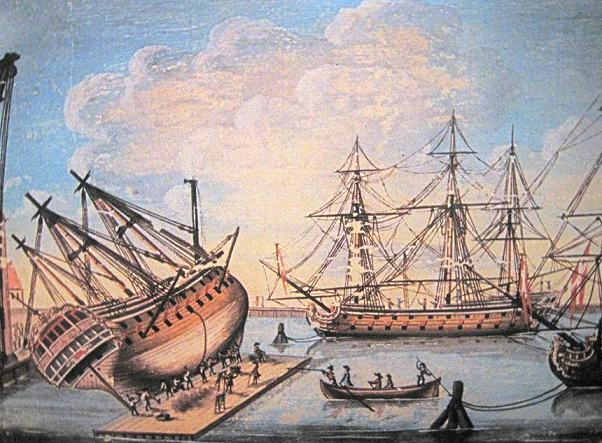 Throughout the 17th century, ships grew in size. Mayflower (1620) was 180 tons. Vasa (1628) carried 1,300 tons, making her one of the largest ships of her era. In 1637, Sovereign of the Seas weighed in at 1,522 tons and by 1765 HMS Victory was over 2.000 tons. Of course, smaller ships continued to have their uses. The pirates of the 18th century favored shallow draft brigs and sloops, usually no more than 120 tons. The privateers of the following century preferred the same types of ships, but usually even lighter and faster at between 90 and 100 tons. Renato Beluche’s Spy, for instance, was just 95 tons. 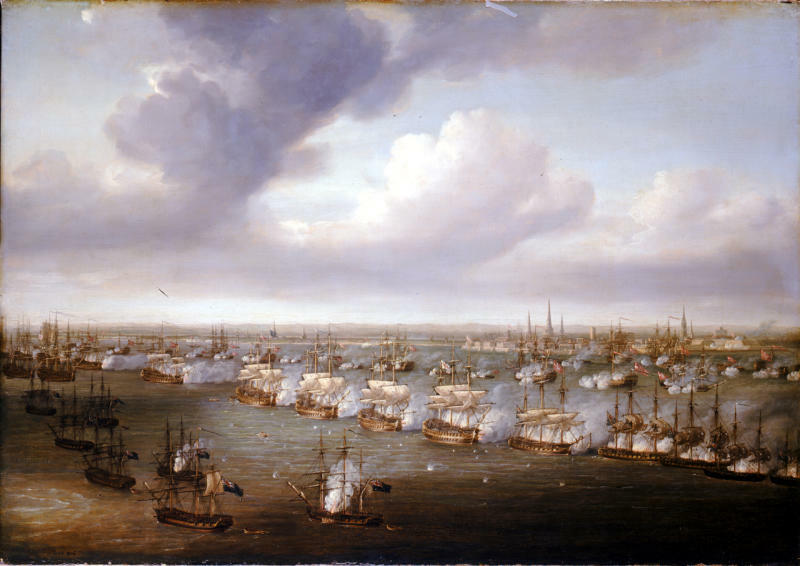 Over in the U.S., heavy warships began appearing at the end of the 18th century. 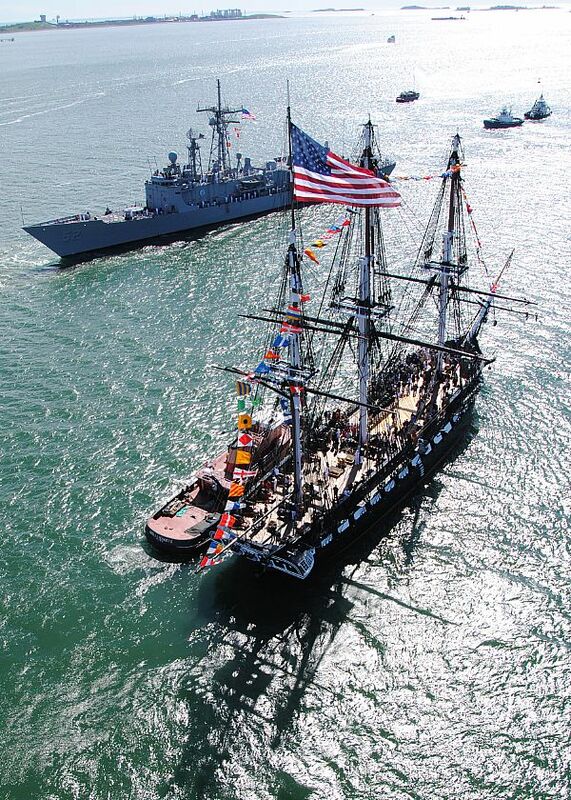 USS Constitution, built in 1797, was 2,200. By 1890, ironclads were the norm; USS Maine weighed in at an almost unfathomable 6,650 tons. These days massive tankers of 500,000 tons or more are pretty much the norm. And then of course there are those cruise ships and mentioned above. It’s hard to wrap your head around, and sometimes disconcerting to be aboard. I’ll take a good little sloop like Spy over a QM2 any day, thankee. 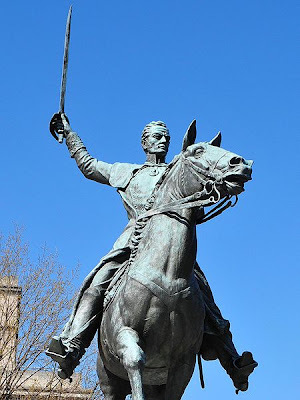 July 24, 1783: Simon Bolivar, liberator of half a continent and patron of many a famous privateer, is born near Caracas, Venezuela. Header: Equestrian statue of Bolivar in Washington D.C. In the British isles, cant has for many centuries meant a dialect or way of speaking as in “The cant of Cornwall.” Aboard ship, though doubtless the word used in that sense did come up, particularly in the Royal Navy, cant tends to mean slightly off balance or off center. Cant is what you do to a ship when you are preparing to careen her: you turn her on her side. It’s not the most ladylike position but I once heard an experienced sailor, who happened to be a lady herself, compare it to a yearly gynecological exam. “It’s damn humiliating,” she said. “But it’s better than the alternative.” None of your old salts would have made such an astute comparison I’ll venture to say. A cant hook is a lever with a hook on one end that can be used for moving heavy articles, particularly the ship herself. Cant ribbons are those painted moldings on a ship’s side that are not strictly horizontal or straight. A cant spar is a small, handmade pole that can be used for booms or yards. 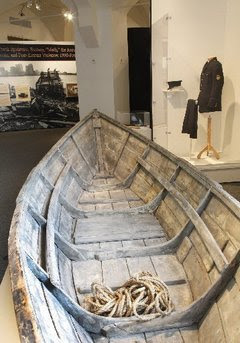 Cant timbers are those that are not square to the center of the ship. These are usually found at bow and stern. A cant rope or four-cant is rope made from intertwining four lengths of a particular fiber. On old whalers cant blocks, which were also known as cant purchases, were used to heave the body of the whale around while flensing it (removing the fat). A block would be hung from the main masthead and another attached to an incision made in the body of the animal between the neck and the fins. This cut was called a cant. A ship is said to cant her ballast when she rolls over so far in a high wind or storm that her ballast shifts to leeward, and she cannot right herself without it being shifted back. Our modern term cantilever, as occurs in plantation shutters when partly open or closed, comes from the similar ventilation units installed in some ship’s quarter galleries (aka the captain’s bathroom). These were known as console brackets or canting-livres. A cantara is an old buccaneering term for an out-of-the-way place to take on water. A canteen is not only a flask for water or liquor, but also that venerable box which holds the captain’s silver dining utensils. Cantick-quoins are small, three sided blocks of wood wedged between cargos to keep them from bumping into their neighbors. A cantera is a type of Spanish fishing boat used in the Mediterranean. And finally, troops can be quartered in conquered territory in cantonments. The troops are housed in various settlements near one another so as to afford constant intimidation in the countryside. This is a tactic that the British practiced with initial success against their American colonies. I am personally opposed to anything that smacks of prohibition. History will show that whatever a government is prohibiting, be it weapons, foreign goods, alcohol, or drugs, the laws made and money spent to accomplish the task is wasted. The flow of contraband does not stop just because it’s contraband. Instead, a whole new entity – usually criminal – steps in to keep the wheels greased. From the Laffite brothers in Barataria to the mob in the 1920s to modern drug lords, the only entity making big money is organized crime. That said, there are the people who move the product too, and their stories are sometimes even more interesting if more often forgotten. That’s why I was thrilled to come across a brief entry at the Louisiana State Museum’s Facebook page. It’s a short but interesting glimpse into yet another episode in the Gulf Coast’s smuggling history. In 1929 the Canadian registered brig I’m Alone was on one of her usual cruises in the Gulf of Mexico. Her habit was to drop anchor off the coast of Belize in Central America, load up with cases of booze and then head for the Louisiana coast. I’m Alone’s usual drop off point was Vermilion Bay where small craft would take on her cargo and ferry it inland on the bayou waterways once used by smugglers like Big Rene Beluche and the Laffite brothers. On March 22nd, however, the usual habits went right out the window for I’m Alone and her crew. She was spotted by U.S. Coast Guard cutter Dexter after nightfall. Dexter demanded the unknown ship hove to for inspection and, when she did not, the Coast Guard opened fire. I’m Alone sank near Marshall Island. Her captain, Jack Randall, and most of her crew managed to escape drowning in the dory pictured above. They were taken into custody (as this short but amazing contemporary video shows) and it appeared they would serve time on smuggling charges. Captain Randall, however, argued loudly that he had been in international waters at the time of the attack and was therefore not in violation of U.S. prohibition laws. The Canadian government got involved and a joint commission was formed with U.S. and Canadian members to hash out the issue. The commission found in favor of Captain Randall and his crew. The U.S. eventually paid reparations to Canada in the amount of $25,000 along with the captain and crew of I’m Alone ($25,000) and the widow of a seaman who drown ($10,000). Find a brief but in depth evaluation of the case from April, 1929 here. This is but one of so many forgotten incidents, albeit with an interesting twist, that proves once again: nothing good comes out of prohibition. Though blue water is the love of every dyed-in-the-wool seaman, a ship has no choice but to come near land now and again. Most lubbers imagine that it is out in the open ocean where the old wooden ship and her salty crew were in the largest amount of danger. In point of fact, the closer to shore a ship comes the more likely her chances of accident, injury or total wreck. The tides in any given port play an enormous part in either the safety or the demise of ships going in and out. Knowing as much as possible about their habits and quirks can be the difference between finding safe harbor and never going home again. General understanding and documentation of tidal patterns has been around since man went out to sea. The Egyptians, who were leery of the vast ocean – as they knew the Mediterranean – but very familiar with their beloved Nile, left enormous amounts of documentation not only on Nile floods but on ebbs and flows in the Delta as well. Neither the Greeks nor the Romans were particularly forthcoming about tidal patterns and those master mariners, the Vikings, were not keen on writing down things they seemed to consider common knowledge. Both in the east, particularly China, and in the west, documents regarding tidal fluctuations began to show up around 1200 CE. The earliest extant tidal table was produced in 1250 at St. Albans Abbey in Britain. The listings are meager, giving fluctuations for London and the Thames only but it was a start. In 1802 the New American Practical Navigator was published in Boston. Its author, Nathaniel Bowditch, connected tidal flux with the phases of the moon in an almanac style that would influence future documents. By the 1830s, both the British Almanac and the American Almanac included predictions for high and low tides in major ports along the Atlantic coast and, in the case of the American Almanac, the Gulf coast as well. 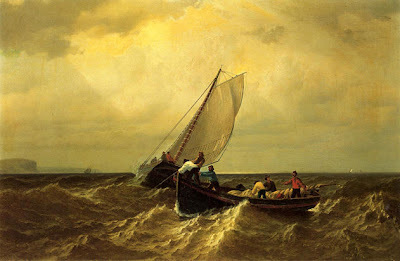 There are no certainties when one is dealing with the sea, however, and sailors had to know the variations possible in documented tidal fluxes. This meant having knowledge of the factors that could alter the regular tides as documented. First and foremost, one must be clear that any tidal table was no more that an educated guess. Seamen know that in places with vast discrepancies between levels of water at the two high and low tides in any given day, the tables could not be trusted. Keeping an eye on the barometer was also advisable; higher tides than predicted were likely to occur when the atmospheric pressure was low and vice versa. Strong winds, even those originating far out to sea or well inland, could affect high tides in particular. Wind coming in off the ocean might make a high tide much higher, while wind coming off land – particularly strong, warm winds like a Santa Ana or Mistral – could decrease the depth of a high tide. Heavy storms have the same affect with the added irritation of altering tide times by up to an hour. There were places in the world that have extreme tidal fluxes, and by the late 18th century most mariners knew where the major ones were. The Sea of Okhotsk between Russia’s mainland and the Kamchatka Peninsula and the English Channel, for instance, are renowned for their very high tides. The most extreme tidal fluxes in the world are on the Atlantic coast of modern Canada, particularly the Bay of Fundy where tidal runs can range in height as much as forty-five feet. Some experts estimate that the mid-tide flow of water here is equivalent to that of all the rivers and streams on Earth. The wonder of the tides is just another reason to stand in awe of the sea. Don’t stand too long, though; there’s work to be done and no one likes a gawpus. In popular imagination, Vikings are an unstoppable force that descended from the dark, cold North of Europe and cut a swath around the world. From Asia to North America they raided, plundered and settled; it has been proven through genetic testing that every modern individual of European descent with red hair has some Viking ancestry. That’s pretty impressive. Perhaps this idea about our Norse ancestors makes the new information from an archaeological dig at Weymouth in Dorset, England a little hard to swallow. Here, along the rugged coast, a burial pit was discovered in 2009. It contained the mutilated skeletons of what were originally thought to be local Britons. The bodies were decapitated and chopped up, with different body parts buried in heaps together. No weapons, armor or clothing was found in the pit so the speculation is that the men (there were no female bodies found) were executed by Roman conquerors. According to this article at Guardian.co.uk, that speculation was entirely incorrect. 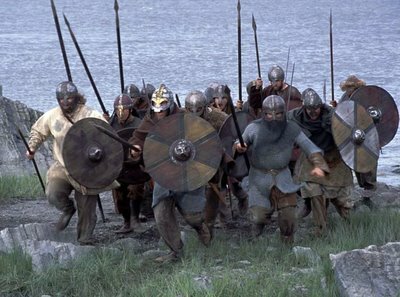 Carbon dating has shown that the massacre took place in the late 10th or early 11th century and genetic testing shows that the young, fit men who died were not British Islanders, but Scandinavian Vikings. In this case it appears that the native population rose up, took charge and brutally turned back the raiders from the sea. Another fascinating mystery has been revealed by the 51 skulls found in the burial pit. Most had all their teeth in tact and in good health. Also, most had intricate patterns of horizontal lines filed into their front teeth. This is not a new discover when dealing with the skulls of Viking warriors, but it does add to mounting evidence that the practice was common if not ubiquitous among them. As noted in this related article, Caroline Arcini, an osteologist at the Swedish National Heritage Board, has been studying Viking teeth filing for some years. Though no one seems to know exactly why the warriors had there teeth filed, it appears that many of them underwent the painful process and that colorings such as charcoal may have been rubbed into the resulting striations. Arcini, who the article notes has “… scores more such teeth in her desk,” has written a children’s book about the practice: The Viking’s Grim Grin. It’s difficult to say how painful the process of filing teeth may have been, but it wouldn’t have been a pleasant experience. Like the image of the 18th century pirate with a shiny gold tooth, maybe having filed teeth was simply a way to show status and bonding in a very exclusive boys’ club. Only time and research will eventually tell. 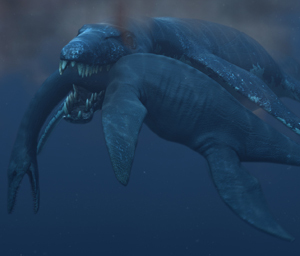 Over at Nat Geo’s website they’re touting the skull of potentially the “largest sea monster” yet discovered. Of course, journalists will snicker behind their fans at the title of the article; everyone knows you bring them in with big promises. The facts of the case, as it turns out, are a little less impressive if no less interesting. The skull in question is that of a pliosaur and was found by amateur fossil hunter Kevan Sheehan at the Jurassic Coast World Heritage Site in Dorset County, England. Pliosaurs were a form of plesiosaur which was, according to The Encyclopedia of the Sea by Richard Ellis, not a dinosaur but a marine lizard. These creatures swam the coastal oceans of most of the world in the Triassic and Jurassic periods. They averaged about 15 feet long, had four, flat flippers and sported pair of high nostrils similar to a modern whale’s blowhole. The long necked versions, called elasmosaurs, are sometimes bandied about as a possible relative of the elusive Loch Ness Monster. The skull in question is almost eight feet long and the article notes that it “… would have had a strong enough bite to snap a car in half…” Disconcerting on any level but is it the “largest” prehistoric skull yet found? July 17, 1577: Martin Frobisher, commanding Gabriel and in search of a Northwest passage to the Pacific, drops anchor in what he will name Frobisher Bay and is the first European to set foot on Canada's Baffin Island. Frobisher will later sail with Drake and command vessels against the Armada of Spain. Many people with even a passing interest in sailing have heard phrases like under sail or under way (not “weigh”, by the way, but we’ll talk about that in a minute). The uses for the word under aboard ship are myriad and, in some cases, a little bit amusing if not down right curious. Under can refer to the state of a ship’s canvas and/or rigging. She is said to be under bare poles when she has no canvas aloft as when she is in port or in a very heavy storm. Under canvas is the same as under sail; this is the opposite of under bare poles with sails set and at the ready. Under way means the ship is beginning to move under sail. As noted in The Sailor’s Word Book, this is sometimes erroneously spelled “under weigh” which actually means that the ship is in the process of weighing anchor. In such a case she may have no canvas spread at all. 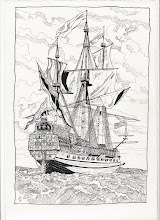 As the authors point out: “This is a moot point with old seaman.” That said, it is not a moot point for those writing about ships, shipping or in the line of nautical historical fiction. 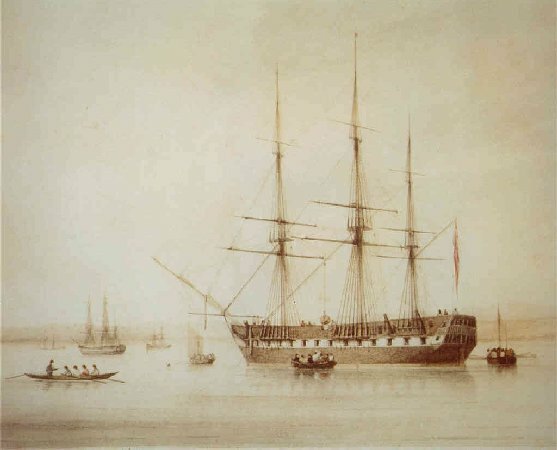 A ship may be under manned, as in not enough hands to run her, or under masted, in which case her masts are too small and/or short making her slow and sluggish for want of sail. She may be found under the lee, sheltered from the wind by land, a spit, a mole or even a larger vessel. This is sometimes also referred to as under the wind. A ship that is under the sea is caught in a bad gale, and not succeeding much against the wind. Under deck is the floor of a cabin or deck. Under foot is said of an anchor that is directly beneath the ship; not always an advantages position for such a device. A cannon is said to be under metal when its muzzle is pointed downward with the breach above it. This is the common way to store guns aboard us to keep moisture out of the chamber. An under current is similar to an under tow, with the surface of a body of water flowing in one direction and the under portion of the water ebbing in another. This is not only dangerous for swimmers but for boats as well which can be make no headway despite oars and sails working to the best of their ability. Similarly an under set occurs near the shoreline of large harbors and stretches of coast wherein the wind hurries waves – and anything caught in them – along to crash against the land. The parties who take upon themselves the risk of insurance, and so called from subscribing their names at the foot of the policy. They are legally presumed to be acquainted with every custom of the trade whereon they enter a policy. Long before Triple P was even imagined, I read this article over at the always worthwhile Cracked website: The 9 Most Meaningless Corporate Slogans. As usual, the folks at Cracked hit the nail on the head while still maintaining a humor level refreshingly well above the middle school lunchroom. In the case of this piece, writer Conrad Schikedanz (Bon Dieu, I hope that is his real name) skewers corporate slogans. And what a fine job he does indeed. If you're taking orders from a cartoon pirate on a bottle of rum, you've probably already missed the boat to the land of responsible drinking, making this slogan rather moot (assuming you're sober enough to read it). This one is just barely worse than the Captain's other slogan, "Got a little Captain in You?" He goes on but I’ll let you enjoy the splendor of it all for yourself. Click over when you’ve got a minute; you won’t be disappointed. 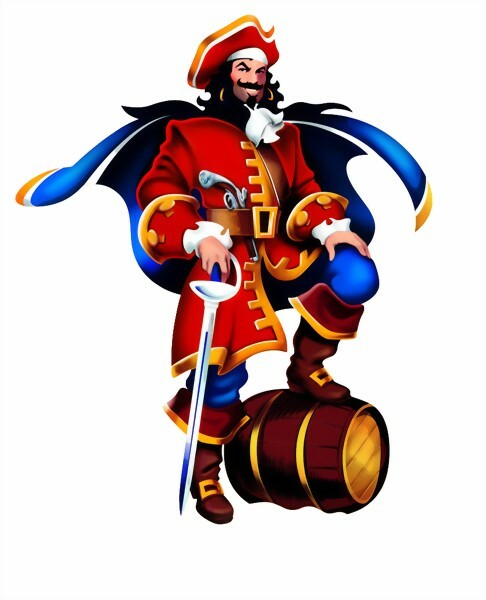 With that, I’ve got little to add aside from what I’ve said here before about a major liquor bottler co-opting an infamously brutal buccaneer and turning him into a cartoon stereotype to sell their booze. But I guess that’s their privilege. To paraphrase the great Eddie Izzard: It's the American dream! Jean Joseph Amable Humbert was born in Saint-Nabord, France on August 22, 1755. The details of his family are sketchy but it is reasonable to assume, given that Humbert grew up to be both a soldier and a passionate Republican, that they were squarely bourgeois. It was only later in life, after joining the army at Lyon and rising to the rank of Brigadier General in 1794, that Humbert would become entangled with those famous French/Americans Pierre and Jean Laffite. 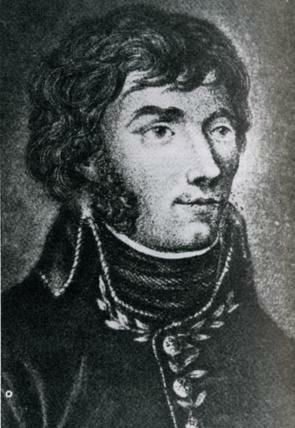 Humbert took part in France’s ambitious invasion of Ireland lead by General Hoche in 1796. Despite early success, he was captured by the British. Because of his efforts to establish a republic there, a monument still stands to his memory in Ballina, County Mayo. The General was paroled and later sent to put down the bloody revolt in the future island nation of Haiti. Though Humbert did his duty, his Republican leanings found him sympathizing more and more with the rebels. When Napoleon declared himself Emperor, Humbert broke with his mother country permanently. He headed out to find glory in the liberation of Spain’s provinces in the New World. In 1808, at the age of 53, General Humbert arrived in Philadelphia. By this time in his life Humbert was used to being in charge and he had a confident way about him. Tall and lean, the days when he could be called handsome were certainly behind him. He wore his hair long and had a full beard. All of his swagger and charm was unfortunately overshadowed by both imprudence and an addiction to alcohol; never a good combination. The General began soliciting potential backers for his scheme to liberate first Texas and then Mexico. Many well known men of Spanish origin were already involved in the endeavor but none of them had known much success. Humbert, with his characteristic confidence, was sure he would triumph where others had failed; all he needed was money, arms and men. After the almost hilarious blunder of propositioning the Spanish ambassador, Onis, to join the cause, Humbert headed out to Louisiana in the summer of 1813. Here a group of investors that included some of the most well connected men in New Orleans was funding, for potential profit, the Mexican junta against Spain. Attorneys John Randolph Grymes and Edward Livingston, Commodore Daniel Tod Patterson of the U.S. Naval Station, and wealthy merchants Auguste Davezac and Joseph Sauvinet were just a few of the names on the list. Transporting the arms and specie supplied by this loose group of “associates”, as they called themselves, were men like Dominique Youx, Renato Beluche, Vicente Gambi and William Mitchell all under the auspices of associate members Pierre and Jean Laffite. The entire set up was a shady – and potentially illegal – business. General Humbert was welcomed, and at first seemed to fit right in. By the following year, the General was quite cozy with the Laffites. Stories have circulated that Humbert was already acquainted with Dominique Youx from their mutual time defending French holdings in the Caribbean, including Haiti and Guadeloupe. If that was the case, Humbert’s entrée into Barataria was virtually assured. In the spring of 1814, he appears to have been enjoying Jean’s hospitality on Grande Terre. In early summer of the same year, Humbert set out aboard a felucca captained by Youx and headed for the Mexican port of Nautla. Humbert would act as delegate, pretending to be sent by the U.S. in the hope of meeting with and perhaps acquiring funds for arms from the local insurgents. Infighting among two rival factions of the insurgency made Humbert’s mission almost impossible. Bickering between the two leaders, Anaya and Rayon, meant the General needed to take sides. He chose Anaya, who did manage to pay over $5,000 for the gunpowder Youx had stowed in his felucca’s hold. As was usual with Humbert, his choice proved short-sighted. Rayon took control of the junta in August. Youx sailed for Barataria with Humbert and Anaya aboard him; they arrived in early September. The shadow of both the war with Britain and the hostility of the U.S. against the Laffites were now far more pressing than any revolution in Mexico. Like so many other Frenchmen in America, Humbert joined with General Jackson to make a stand on Rodriguez Canal. According to both William C. Davis and A.J. 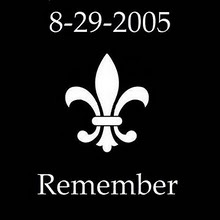 Langguth, Humbert joined Jean Laffite on the west bank of the Mississippi during the Battle of New Orleans, leading the French and Creole speaking men in that battalion. Though General Humbert, like all those who took part in the defeat of the British in January of 1815, was feted and embraced his star was already waning. His alcoholic binges, and accompanying raging temper, had become legendary. Though he would briefly join the Laffites at Galveston and continue to hunt for glory in local uprisings, he would not know success. He was found dead in a rented room in New Orleans on January 2, 1823. Humbert was vilified by the Spanish after his death but, in sharp contrast, he is remembered fondly in and around New Orleans. The most repeated story of the famous General, told by both Lyle Saxon in Lafitte the Pirate and Robert Tallant in The Pirate Lafitte and the Battle of New Orleans, surrounds a dinner party held in the city. Though many storytellers, including Tallant, mark the occasion as Humbert’s birthday it is more probable, as both Davis and Jane Lucas de Grummond note, that the celebration was for Bastille Day. All the usual suspects are gathered; the Laffites, Youx, Beluche, Gambi, Sauvinet, Livingston, Davezac and so on. Eventually, Humbert was several drinks ahead of the others and, in his cups, he looked around the table. His jovial face turned stern; he rose, swaying slightly under the weight of his imbibing, and looked pointedly at the Laffites. The story is almost certainly apocryphal but many of us can sympathize with the old soldier celebrating a dear tradition so very far from home. Happy Bastille Day one and all. Vive la Liberté! Accidents of this type are so common that remedies ought always to be in the house. Take any portion of linseed oil, or sweet oil, and stir lime-water into it till it is as stiff as you wish to spread on a cloth. Apply it as soon as possible. In common cases, nothing will be necessary but to renew it occasionally. This is one of the safest and best remedies for burns. This quote, written by Mrs. Child in her 1837 publication The Family Nurse, echoes almost exactly the treatments listed over and over again in the logs of navy surgeons on both sides of the Atlantic. Fiction and Hollywood are both fond of showing the blood spattered surgeon laboring grimly in his dim orlop over a screaming sailor, his saw and knife at the ready. In fact, amputations, though undoubtedly necessary, were in no way as frequent as we may believe. By contrast, the incidents of burns at sea were quite high. The working of guns, it goes without saying, was always dangers but more mundane mechanics, like hot tar and the galley stove, could do frequent damage as well. Any working ship, be she a smuggler’s pirogue or an 800 man ship of the line, was going to see men burned. The only issue was of degrees. Mrs. Child continues in recommendations, noting that “…bathing in sweet oil… is considered an excellent thing to take the fire out.” This would be a nice alternative at sea, given that cool, sweet water might be hard to come by and ice would be impossible to find anywhere but the extremes of north and south. Our modern convenience of running cool water over a finger burned at the stove would be impossible. Turpentine is recommended for blistering, but “Care should be taken not to apply the turpentine to sound skin…” Particularly in such cases, the patient should be kept warm and this is a very salient point. Fever is not uncommon in burns; even a bad sunburn can cause what would have been a dangers rise in temperature. Mrs. Child recommends that stubborn blisters be opened with a needle. This painful operation should be followed with basilicon ointment which is composed of resin, beeswax, olive oil and lard. The cure for the intense pain of a bad burn was invariably dosing with laudanum. This tincture of opium suspended in alcohol would, indeed, have given some relief. Its unfortunate addictive qualities could be potentially as harmful as the burn, however, and overdosing was a risk. In his memoirs, Dr. Blunt of the Royal Navy mentions a man whose arm was burned so badly in battle that it later needed amputation being given too much laudanum by one of the surgeon’s assistants. The sailor, perhaps mercifully, died in his sleep. Care should be taken to separate toes and fingers with bandages, lest they grow together. While a well stocked medicine chest was rarely an issue in the service, merchants and freebooters had to improvise. A large stock of medicines was a coveted prize for any pirate ship, with the cook usually put in charge of the find. 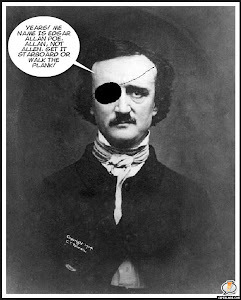 It was to him that a pirate went for a bandage, a blue pill or to have a tooth pulled. Given the potential for death from even the simplest accident, it is hardly any wonder that Edward “Blackbeard” Teach blockaded the port of Charleston for a set of surgical instruments and a chest of medicines. The story goes that he had not only rampant pox and “spotted fever” aboard him, but two men suffering burns. Today marks the 207th anniversary of the much storied duel between Alexander Hamilton and then Vice President of the U.S. Aaron Burr. As most of us know, Hamilton died of wounds suffered at the hands of Burr and, despite the fact that both men had glaring character flaws acknowledged by their peers, Burr became a political and social pariah as a result. Now, before I go further, I’m sure more than one of the Brethren in wondering what the heck the Hamilton/Burr affair has to do with pirates and privateers. The answer is simply, quite a lot. If it had not been for Burr’s post-duel career, two of America’s greatest pirates would probably never have become Lords of Galveston. 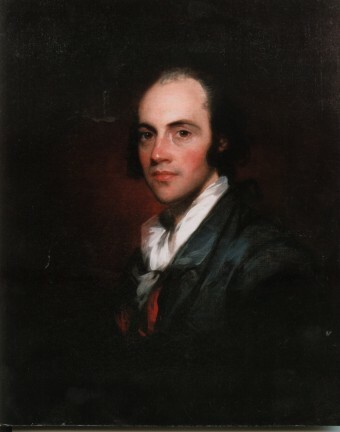 Though there is a reinvention of the exploits of Aaron Burr going on in modern American history, the facts of the man’s life speak for themselves. After serving in the Continental Army during the Revolution and receiving a law degree from Princeton, Burr plunged headlong into politics. Though he was a charming and intelligent gentleman, he was perhaps too vociferous about his largely unpopular opinions particularly after taking the office of V.P. His various smoldering animosities came to a head when he challenged Hamilton. The men met in Weehawken, New Jersey; Hamilton died on July 12, 1804. Burr would finish his term as V.P. despite litigation brought against him for Hamilton’s murder (of which he was cleared). All his future political opportunities, however, died with Hamilton. Unfortunately, though, this did not change his aspirations. Some time in 1805, Burr began to get very cozy with the ambassadors from Spain. Spain was still gnashing her teeth over Napoleon’s sale of what she perceived as her Louisiana Territory. Getting it back would occupy a good deal of her U.S. ambassadors’ for the first two decades of the 19th century. Britain was also contesting the legality of the Louisiana Purchase and her Ambassador Merry joined Spain’s Yrujo and the former Vice President in a plot to try to dissolve it. Though many modern historian’s discount Burr’s involvement, that he was in touch with both ambassadors is documented by correspondence. 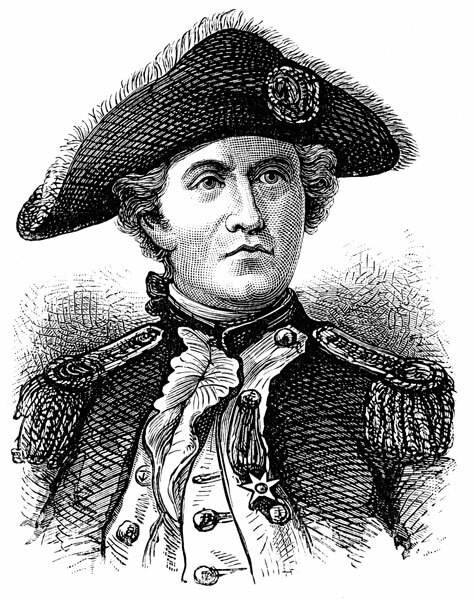 What is not clear is why Burr backed out of the operation after a visit to New Orleans in 1806. Burr was arrested on a treason charge, of which he was later acquitted, in 1807. Left without local operatives, Spain would cast about until after the War of 1812 when Britain officially abandoned the idea of returning Louisiana to Spain. In 1815, however, through Spanish spy Father Antonio de Sedella, Ambassador Onis would be introduced to the Laffite brothers. Pierre and Jean would feed the ambassador fictional but plausible stories – including that their maternal grandmother was a Spanish Jew – and collect monetarily for their trouble. It was Spain, for the most part, that backed their largely successful privateering operation at Galveston in the hope of catching and prosecuting the very privateers who used the port. The duplicitous conduct of the Laffites did far more to hinder Spain’s ambitions than they did to help them. One has to imagine, however, that had Burr continued in – and been more successful at – his dealing with Spain, the Laffites might simply have drifted into obscurity after the Battle of New Orleans. Instead, their anti-hero image has been preserved for all time. Politics, greed and narcissism frequently make strange bedfellows. This instance seems to be no exception. 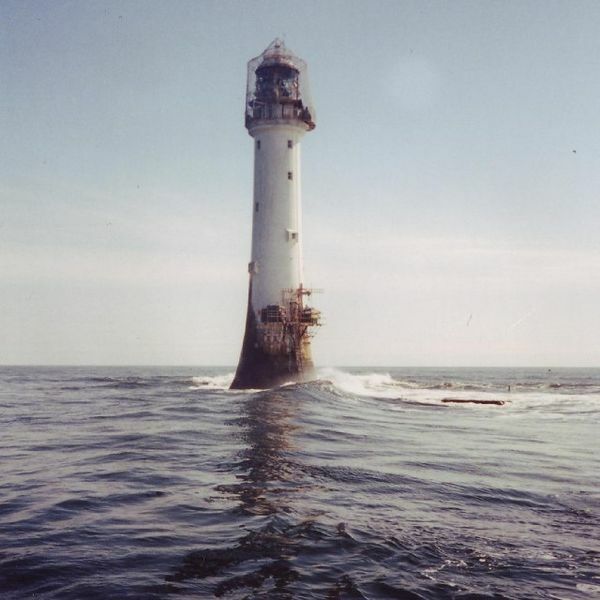 July 10, 1808: the first stone is laid for the Inchcape Light (or Bell Rock Light) at the treacherous entrance to the Firth of Forth in Scotland. Around the web, other interesting points of note from this week in history include the beginning of the Jeannette Arctic Expedition at The Naval History Blog, the story of Union hero William Tillman from the Civil War at Almost Chosen People, and - also from NHB - the first prize taken by former U.S. merchant Delaware in the Quasi-War with France. Enjoy! One who does nothing and wastes time; a lazy person; a sluggard. The word comes to us from the Middle English word idlen, meaning useless which may have been influenced by either the Anglo-Saxon word idilian or the Old French word idutile (modern inutile), both of which also mean useless. By land, an idler is what a friend of mine used to call a “minimum participator in life”. But at sea, the word is a fond reference to some of the hardest working people aboard a blue water ship. An idler, in seamen’s terms, is a person who, due to their need to work continuously throughout the day, is not expected to stand a night watch. This allows these sailors to be up with the sun and back in their hammock long after supper has come and gone. The only exception to their schedule is during times of stress such as battle or storm when all hands are expected to be on deck. 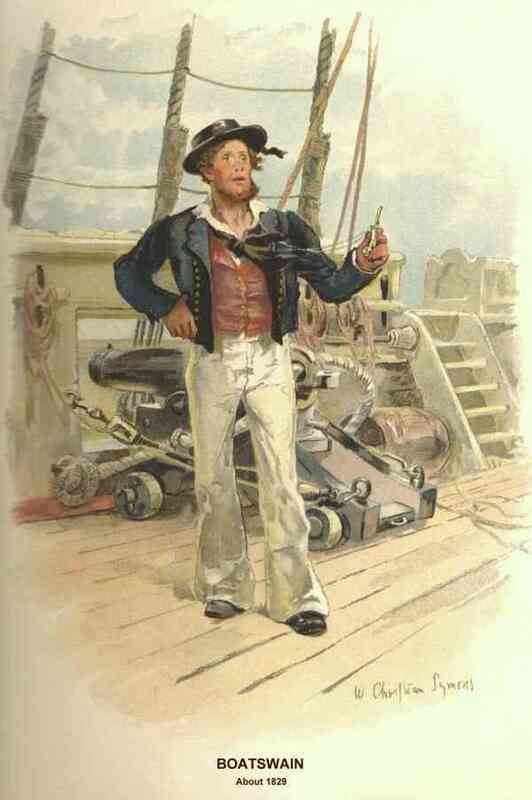 The main officer jokingly referred to as an idler was the bosun. His constant management of all sails, rigging, anchors, cables, flags, pennants and so forth made him – and the knowledge he brought with him – indispensible at almost any point during a cruise. Of the four main idlers, it was a good bosun who probably saw the least time in his cot. Along with the bosun, the sailmaker, carpenter and cook where also considered idlers. By the 18th century, surgeons and their mates, marine officers and paymasters had also been added to the list. Much like waisters, who were simply given their name because they tended to work at a ship’s waist, idlers were so called as an amusement. Sailors love to name a thing, and if they can make its moniker worth a chuckle so much the better. With all that, the occasional grumble was doubtless heard on a particularly unpleasant night: Damn idlers; sleeping while we stand the graveyard watch. Sea Shadow, the U.S. Navy’s floating answer to the stealth bomber, is on the auction block. Not surprisingly perhaps, bidding is slow. Though she looks a little bit more like a houseboat for Anton LaVey than any kind of stealth warrior, Sea Shadow has a surprisingly star-studded history that is keeping her in the news. As this article from Yahoo! News notes, Sea Shadow appeared in one of the longest running movie series in history. She was the inspiration for the evil super ship in the Bond movie Tomorrow Never Dies, giving the villain a seagoing base for the instigation of his dastardly plans. Sea Shadow, though sometimes erroneously referred to as United States Ship, was never commissioned by the Navy. Her use was purely experimental; find more about her here. She is approximately 160 feet long and 70 feet at the beam with a price tag of around 195 million U.S. dollars. As of this writing, she will go to the wrecking yard by the end of July, or earlier, if no buyer comes forward. So here’s your chance; a houseboat fit for a villain – or at the very least a rebel – with a bit of a fixer-upper feel. Are you in? 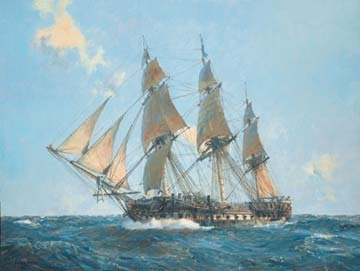 In the War of 1812 Captain David Porter, commanding USS Essex in the South Pacific, was engaged in the pursuit of British whalers. His success was so great that he essential shut down His Majesty’s whaling fleet, costing Britain millions in lost revenue. Captain James Hillyar, in command of HMS Phoebe, was dispatched to take, sink or burn Essex. The two ships, along with their tenders, met and engaged in Valparaiso Harbor off Chile in the spring of 1814. I now consider my situation less unpleasant that that of Captain Hillyar who, in violation of every principle of honor and generosity, and regardless of the rights of nations, has attacked Essex in her crippled state within a pistol shot of neutral shore, when for the last six weeks I have daily offered him fair and honorable combat on terms greatly to his advantage, the blood of the slain must be on his head, and he has yet to reconcile his conduct to heaven, to his conscience, and to the world. Porter and the surviving members of his crew were back in the United States in time to witness the end of the war with the Battle of New Orleans. Happy Independence Day to the U.S. Brethren, and a hearty cheer for one of our finest, Commodore David Porter. A want of true knowledge in this department has led to putting too great a weight in ships’ bottoms, which impedes their sailing and endangers their masts by excessive rolling, the consequence of bringing the center of gravity too low. Ballast is in broad terms the stuff that goes into the hold of a ship to bring her to the right water line. Too little and she is too high in the water, making her subject to rolling and capsizing; too much and she is so low that the potential for foundering is great even in relatively calm seas. Ballast is not necessarily made out of one thing; it can be anything heavy, really. In times past brick, rock, iron, and soil have been among the things used while in some modern ships water is ingeniously employed to keep a ship level upon the sea. Out of the custom of ballasting a number of seagoing terms, and rights as well, have come. Ballastage, for instance, is the right of a monarch or government to tax ballast. A port official known as a ballast master would oversee the ballasting of a ship and the collection of the levy. This was particularly common in Britain and her holdings; it was one of the many items that the American colonies added to that arm-length list of taxations without representation. A ballast basket is a container for lifting ballast onto a ship via block and tackle. It was often used when at sea by the gunner to move ordinance as well. Obviously, it was not a basket per ce but more like a box made of wood or metal. The ballast mark on any ship was the waterline around her hull when she was carrying her favored ballast. Sometimes a ship was completely without ballast, particularly a merchant loaded with cargo, but the occurrence was rare. Either way, whether cargo or ballast, when it moved due to the rolling of the ship at sea the term was a ballast shift. Ballast ports were square holes cut into the hull of merchant ships for loading ballast. Ballast shooting, usually through said holes, was the practice of discharging ballast overboard. Most well used ports throughout Europe and the Americas would fine any ship found engaging in this practice. A ship is said to be in ballast trim when she is carrying only ballast. A ballast shovel is an oddly shaped tool that resembles an enormous grapefruit spoon made of iron. Ballast shingle is gravel, usually of slate, used for ballast. Because of the importance of ballast to a ship, the word took on other meanings for sailors. A man was said to have his ballast if he was thoughtful or wise. On the other hand, a mate who lost his ballast was making bad decisions. An officer who carried too much ballast was full of himself and said to have a “big head”. It doesn’t take a sailor to recognize any of those kind. Fair winds and following seas, mates; may your grog be strong and your friends be true until next we meet. 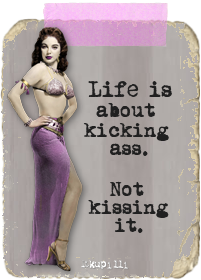 The above quote refers to the type of fantasy mermaid that sailors have exchanged stories about probably as long as they have put boats in the water. A completely different, and far more clinical, view of these much storied merfolk is offered by modern artist Walmor Correa whose mermaid illustration appears at the header. Correa, who is a native of Brazil, became interested in art through science. He developed a fascination with anatomical and wildlife drawings and, after finding he had a rich talent with pencil and pen, developed a style all his own. 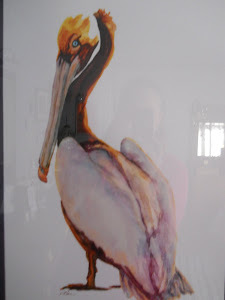 His work is a surprising combination of the kind of studies found in the classic Grey’s Anatomy and the timeless renderings of San Domingue Creole John James Audubon. Correa focuses on such things as odd combinations of species – birdlike rodents, for instance – and crypto-zoological studies. He has even done anatomical pieces based on Marvel Comics characters. He is a prolific artist who has been producing beautifully detailed works of both quirky and disturbing fantasy for over a decade. Two of my favorite pieces by Correa focus on mythical beasts of the sea. The first is, of course, the delicately detailed mermaid pictured above. The most surprising points of the seemingly post-mortem study, to me at least, are her human lungs and the detail on the lower left showing how she would carry a child in her womb. The second is of a Brazilian creature known as an Igpupiara or Ipupiara. According to MythBeasts, this is a seal-like mercreature that was first spotted off Brazil in the 16th century. This type of merfolk is without the scales of a mermaid and has webbed fingers. As Correa presents it, Igpupiara’s internal organs differ considerably from the mermaid’s; even the detail of its mouth and glottis on the right are unfamiliar.